Slightly off-topic here, but are you the real JackSpeticEye? And back to on-topic, contact the support team and they should supply you on a downgraded version of Action!. Ask for version 1.20.2 (the previous one), and 60 FPS videos should be just fine. Also, how do you get 1080p on regular MP4? I thought that only the AMD MP4 had that feature (besides AVI). That's a good idea, thanks for the tip. I'll try to get in touch with them about it. Huh? I don't have that option on my 760 build... Are the files as big as the AMD equivelant (12 minutes = 2GB)? And the problem still exists in my system. I just recorded 1:21 of footage as a test and got 46 seconds of skipping footage back. I'm so happy that I'll finally be able to record my gameplays, one thing when I record the video is recorded at 50fps not 60fps but at the moment I have not had any problems and the size of the videos are comfortable. THANKS!! Yeah, I got the same issue, except I get 40FPS instead... The framerate of the output video seems to be off by quite a bit, atleast on AMD MP4. This is what variable frame rate is. 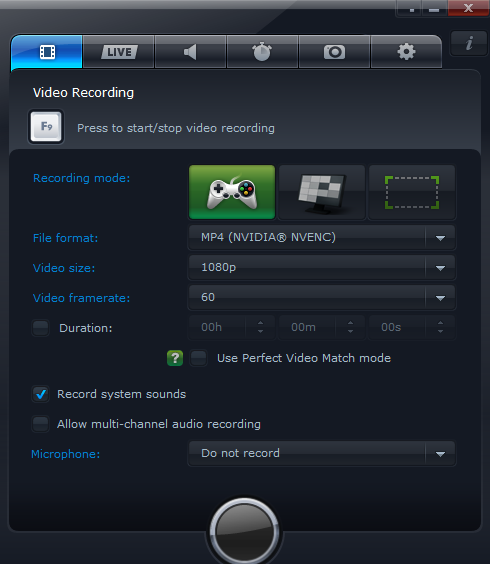 If your computer cannot handle to maximum settings you have set it will change automatically the frame rate to keep the video without stuttering and any additionally interruptions such as audio desynch. lol my computer is enought to record 1080p at 60fps i'm sorry but is your program that have some bugs, because i dont have any problems recording with other programs at 60fps but its okay! Now the program is better as before and thanks for the hard work. 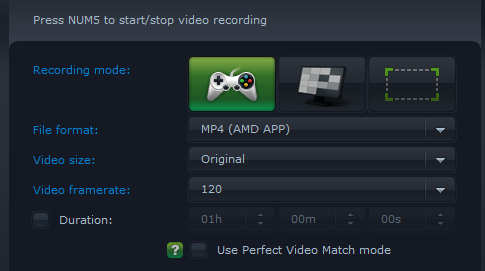 vision wrote: lol my computer is enought to record 1080p at 60fps i'm sorry but is your program that have some bugs, because i dont have any problems recording with other programs at 60fps but its okay! Now the program is better as before and thanks for the hard work. I think the problem is that sometimes you can have a fps drop (because the game is bad optimized or whatever), and now when that happens, Action put down your video frame rate. radi wrote: This is what variable frame rate is. If your computer cannot handle to maximum settings you have set it will change automatically the frame rate to keep the video without stuttering and any additionally interruptions such as audio desynch. Because some of the games I play can at random times ditch below 60 FPS for a splitsecond. And previously when the "sped-up 60 FPS MP4 video" was fixed, it didn't require such a feature.